The Cowboys and Raiders held a joint practice today in Oxnard, California. They did so in front of a significant police presence because Oxnard's two largest gangs—Colonia Chiques and the Southside Chiques—wear the colors of the Cowboys and Raiders, respectively. 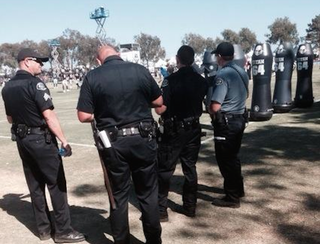 It wasn't the gangs that broke the peace in Oxnard today, though, it was the Cowboys and Raiders. Though it's hard to tell from this recording, Pat Doney of NBC Dallas-Fort Worth says it spilled into the stands where Raiders fans were watching practice. And they weren't finished; there were actually two fights at practice today. This one was between the Raiders offense and the Dallas defense, but after everyone settled down, the Raiders defense and Dallas offense got in on the act. Update: A reader alerted us to footage he filmed right in the thick of the brawl and you can definitely see someone in the crowd hit a player with the Raiders helmet he's holding.